In the mid to late 1980s we would be out every night at some club or other, returning home in the early hours of the morning, our pockets stuffed with the essential little bits of coloured paper telling us where to go next. On some occasions I would have more than ten flyers put by for an evening’s possible entertainment, each of which had to be examined for clues – the names of DJs, the venue, the times, styles of music and dress code. On this basis, the choice of club could be made. Flyers speak the language of club culture and tell its story. In the mid-1980s, they were cheap and nasty. Letrasetted photocopies made at the local library and promoting one-off nights in shabby, poorly equipped venues where the quality of the music was all. The growing sophistication of the scene happened to coincide with the sort of technological advances that led to cards bearing comic book graphics and Macintosh typography printed on to plastics and textured papers. By the end of the decade, flyers represented a minor promotional part of massive, money-spinning ‘rave’ events, and featured full colour printing, glossy finishes and a design style indebted to Victor Moscoso that hinted at the same sort of drugs and leisure lifestyle that his Beardsleyesque muses promoted in the 1960s. Flyers tell us about something that became bigger and grander and more lucrative until it stopped being fun. I suppose I could have kept all mine, put them together with a few record sleeves and style and music magazine layouts of the period, and summed up an era. As it happens, I didn’t need to. Cynthia Rose has done just that in Design After Dark. An extensive collection of visual material from the efflorescent club culture of the 1980s – logos, illustration, advertising, flyers, record covers, posters – it has the instant impact of stepping through a nightclub door, the feel of a scrapbook of a good fun time. 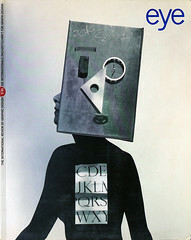 Designer Ian Swift has dealt sensitively with the often unsophisticated work by gathering it together in an unfussy layout, so it’s a shame that his restraint didn’t extend to the cover, a garish ensemble of the worst kind of Macintosh-baroque, or to the chapter headings, which use the closely leaded headline type he and Brody championed in Arena and just look jumpy and mannered. Perhaps these elements, along with the sloppy typography of the text, are meant to say something about the quirkiness and looseness of the club world. But it’s a grave mistake to think that attitude can be translated into the formal context of a book, under full colour, gloss finish perfect-bound conditions. Design After Dark begs to be treated as a picture book. Those who actually read it will discover that, in spite of the title, Rose isn’t really interested in design. She simply uses it as a point of reference while approaching her subject with a truly journalistic zeal for seeking out the people behind the images and making the designers, not the design, tell the story. There is no real evaluation of the product, it just is. The mixing and sampling of music is seen to be mirrored in the use of collage, montage, state-of-the-art photocopying and computer generated images and the work of designer and DJ work is paralleled, but the work itself is not analysed. After dwelling at some length on David King’s adoption of a Constructivist-derived aesthetic for the design of City Limits magazine, issues that are fundamental to popular culture, such as appropriation and the history of popular design in general, are largely forgotten and it’s back to the people. Much space is devoted to eleven designers’ biographies. From these we don’t learn why Fiona Hawthorne borrows so freely from the work of David Stone Martin, but that she has a daughter called Sacha and used to play the tin whistle to finance holidays in Europe. We find out that Ian Swift’s parents died when he was young, but not whether this encouraged in any way his frequent references to the work of Reid Miles. Why the Smiley? Why the religious icons, or the frequent recourse to Dadaist lettering? In what way does Andrea Diamond’s woodcut design ‘give a face’ to the late-1980s reappropriation of 1970s dance music rechristened as ‘Rare Groove’? Such questions are lost among a cast of characters that is as wide-ranging as it is at times incomprehensible. I was puzzled by the inclusion of Paul Elliman and his design for the jazz magazine Wire (where Rose was deputy editor for a short time) which owes more to book typography than to club culture; Fiona Hawthorne’s non-period specific jazz illustration; and by Chris Long, whose work is just ordinary. In this context, designers like Trevor Jackson, George Georgiou and Derek Yates stand out on the strength of their youth and genuine, first-hand knowledge of what things really do look like ‘After Dark’. Yates’s coherent body of work is notable for its naïve symbolism, religious imagery, references to tribal art, and use of computers and woodcuts, not because this makes it innovative (it doesn’t), but because it exploits the prevailing influences of the time. Trevor Jackson, on the other hand, takes a populist approach, aims to sell the product and change styles probably as often as he changes his trainers. Rose tries to persuade us that the real story behind all this is the integration of young Black Britons, and their highly developed ideas about leisure, style and music, into the elitist world of London nightlife; that their ‘Sound System’ way of working has revolutionised the way all young Londoners think and work, and the culture they produce. If Rose was interested in the past or the state of the economy, she might come to the conclusion that youth took much the same turn in the moneyed 1980s, controlling work opportunities and combining work and play, as it did in the 1960s. She is too busy reinventing the wheel to see that it is in the greedy mix of visual material that you might find the real meaning. Nightlife and youth culture are, by their very nature, fleeting and fun, and if you simply let the pictures tell the story, they wouldn’t have very much to say. First published in Eye no. 5 vol. 2, 1991.